We just bought a St. Francis 50 catamaran, SV Aphrodite, and are arranging to have some refits done in Bradenton, Florida. We are relatively new to sailing and live in Ottawa, Canada. Fortunately, we have Pat Reischmann of Hy-Tech Marine to advise us during the refit process. Pat has over 30 years’ experience in the marine industry. He was one of partners, executives, and visionaries behind Manta catamarans. To start, our list was very high-level, and included things like “upgrade sail handling”. My husband was in Bradenton, Florida last week, following his passage from Fort Lauderdale. Thanks to Pat’s guidance and the input of contractors, all aspects of our boat were explored – from the cosmetic to the electrical components. Our list started to take shape and gain details. 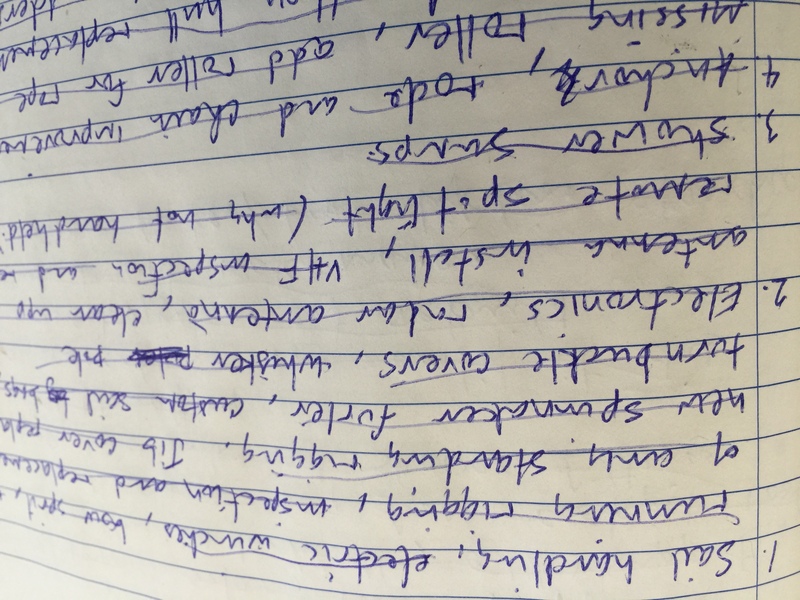 Here is a photo taken from a portion of one of my husband’s notebooks. My husband put his brainstorming list into Excel and fleshed-out details to contain categories, estimates, and contractor names. He put this information into the “Details tab” of our spreadsheet. For the “Details tab” we were fortunate to receive a spreadsheet from another St Francis 50 owner that identified the criteria they used to make their purchase decision.Their criteria helped to add even more detail to our list of possible refits. For example, we are considering putting in another child berth to allow more sleeping room for our family and guests. 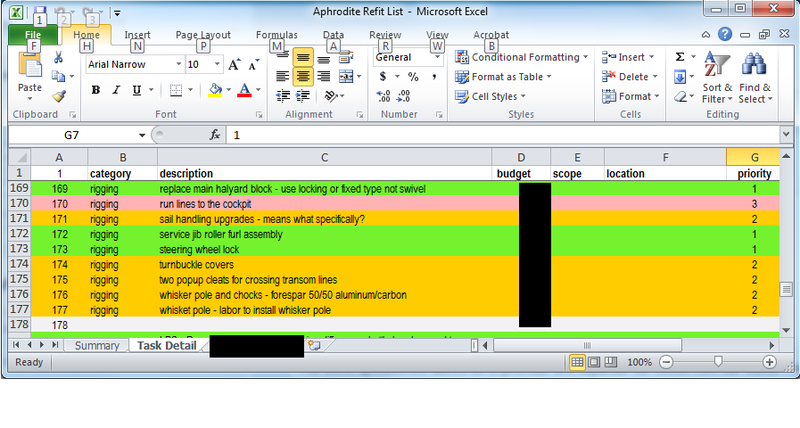 The “Details tab” of our early spreadsheet looked something like this. We use the Excel spreadsheet to prioritize and separate our needs from our wants. In the Priority column, we have assigned colour coding to better visualize the high, medium and low-priority items. Safety-related items, for example, that must be fixed, were assigned priority 1. Whereas, new saloon cushion covers were assigned priority 3 as they would be lower priority. each category, separating out costs for labour and capital expenditure. With so many factors at play, and a budget to adhere to, the “Summary tab” allows us to make purchasing decisions without getting bogged down by the weeds. do we want black dock lines or white lines – is there a benefit? colour of bumpers – does it matter? lightning diffusers – bottle brush type or fans? We are looking at all sorts of product information as well as reviews and forum feedback for each of these items to help us make a decision. Really, we could drive ourselves crazy researching all of these components, or we can save ourselves hours of research and rely on the expert opinion of Pat Reischmann – who knows boats. Incidentally, Pat is steering us towards the bottle brush type of lightning diffusers. Pat says that we should plan on being at the boat at least every week. Being a hands-on owner allows us to meet with the experts – the contractors that are doing the work – and, will help us to better understand the components that are being installed. Living in Ottawa, and managing four young children complicates visits to the boat, but we’re excited about this project and we’re going to do our best to be on our boat as much possible. We originally had blue fenders. Then we started getting blue marks on the side of our hull. Now we only buy white fenders. I don’t know that the color of docklines really matters, but if you get something bright in an odd color, it makes it harder for people to get them confused and sail off with them after a raft-up or something. Did you use Polyform fenders? We are considering buying blue ones size F6 and F7.